Na Nach Nachma Nachman Meuman: Benyamin is the only one who didn't bow to Esav. Benyamin is the only one who didn't bow to Esav. Rachel was doomed by the curse of Jacov- but Benyamin survived. The whole family had been influenced by Laban except for Josef. Laban almost succeeded 100% in destroying our kedusah, similarily Esav by making us bow to him. Laban taught us treason with words, while Esav taught us treason with weapons. Josef was sent to Shechem to "catch" the brothers dissobeying. They were not caught, and wanted "freedom". Had they been right to dissobey their father 16 years earlier when their baby sister had been molested as a child? Was it possible to expect that child molesters could become part of the family? Here too we were being influenced as you can see from the behavior of Ruven and Jehuda, later by the tribe of Benyamin! Esav had no problem integrating his hosts into the family and he gained greatly in wealth and prestige. Because we are a LOST LOST generation, I feel that the Petek is the only one that can remain "clean" and lead our generation. Every other leader, flesh and bones is as dead as the objects he cherishes. The petek is alive because it is the "tserouf otiot" of the True Tzaddik without a blemish. Like Saba says we need to dance and sing uncessantly that we were presented the Petek in this DEAD GENERATION. Shavua tov! Can you explain about their dissobeying Yaakov avinu? >> Josef was sent to Shechem to "catch" the brothers dissobeying. They were not caught, and wanted "freedom". Had they been right to dissobey their father 16 years earlier when their baby sister had been molested as a child? Israac knew through "rouach hakodesh" that his sons were in Shechem, he sent Josef on a diplomatic mission not telling him to reprimand the brothers, but simply to see how they were doing, and "suprise" daddy knows you are in Shechem, (please do tchouva before dad). The fact that they took loot shows that their intentions were not good. Thieves go back to the place of the crime. 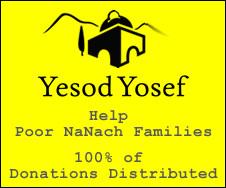 Benyamin and Josef had not participated in the misschief, so even though Benyamin was with the brothers and possibly rightfully jealous of his elder brother Josef, he was not in Shechem because of his deeds, but like the brothers that did not participate in the slaughter, he was going to profit from the loot. later these two brothers try to please their father, by bringing Benyamin back. Yehuda lost two sons, and almost destroyed his own offspring the way Jacob had cursed Rachel. I therefore, do NOT believe Yehuda was guiltless- yet his attachment to the Tzaddik, his father, is entirely what saved him, because like his father, he also became a man of truth! So here we see that ALL the brothers wanted to dissobey Jacov, the "tzaddik ha dor", except for Josef, and to a certain extent, Yehuda and Ruven. Isn't the keeping of secrets and conspiracy a form of dissobedience? Would G-d have let Esav kill Jacov had Rivka not begun this merry-go-round of deceiving the Tzaddik? From the Akeda, we know G-d would not have allowed this to happen or like with Cain and Able he would have created a new Jacov! (Cain caught G-d by suprise- Esav wasn't about to do that- Jacob was pretty safe, but he accepted his mother's authority and her deal- She died when he finally came home).